Successful communication with your players is crucial. Ball juggling is an excellent way to develop and retain a feel for the ball. This section examines the techniques of the block tackle, side block tackle, and sliding tackle. Teams need to defend successfully in a variety of circumstances. The key to successful coaching is preparing your players to make intelligent decisions on the field. For years, the best-selling Skills & Strategies for Coaching Soccer has helped coaches of every level do just that. Now, soccer’s premier coaching resource has been updated and expanded to provide you with more insights into developing individual talent, team tactics, and winning play. Skills & Strategies for Coaching Soccer provides you with over 125 drills for teaching skills and techniques. You’ll also learn how to develop these skills in realistic game situations with beginning, intermediate, advanced, and all-star players. 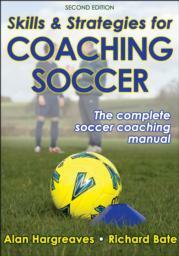 Skills & Strategies for Coaching Soccer is an invaluable guide for coaching any team in any setting. The best team doesn’t always win—but it usually does. Alan Hargreaves MA, Med, DLC, played for Lancashire, Loughborough Colleges, and English Universities. A fully qualified Football Association coach, he directed national residential coaching courses for players up to 18 years of age and codirected the Soccer Academy for Young Players in California. He was head coach for the British Colleges soccer team and coached professional soccer for five years—two years with Stoke City and three years with Crewe Alexandra. He has conducted numerous coaches' and players' courses in England and California and was a consultant in fitness training for soccer and hockey players. Alan directed the fitness training program for the 1980 and 1984 British men's Olympic field hockey team. He has also worked extensively in universities, soccer coaching clinics, and residential camps, many for the American Youth Soccer Organization. Now retired, Alan enjoys playing tennis and golf and traveling with his wife, Janet. Richard Bate, BEd (PhysEd), was the head of the Cardiff City FC Youth Academy and the former director of elite coaching for the English Football Association (FA). He coached at Leeds United FC, Notts County FC, Lincoln City FC, and Hereford United FC. He served as the technical director at Watford FC, and as a technical adviser to FIFA, soccer’s world governing body. He was also the technical director of the Malaysian Football Association and the Canadian Soccer Association. "Skills & Strategies for Coaching Soccer offers insight for coaches at any level. From basic drills to advanced practices, it details techniques and philosophies that will help you develop players both on and off the field."